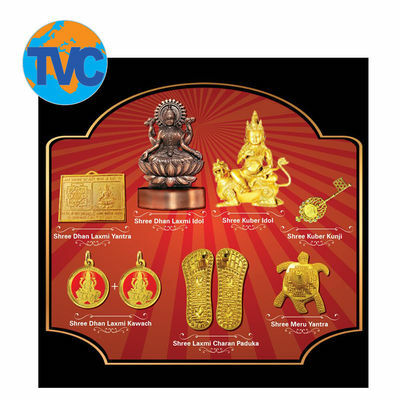 Buy Shri Laxmi Kuber Dhan Varsha Yantra online - TVC Skyshop - Buy world-class innovative products at affordable prices offering full value for money. Install Shree Dhan Varsha and Lord Kuber Kunji in your home or your workplace today and your family will always be blessed with physical, mental and spiritual happiness. Shree Dhan Laxmi Yantra: This is preferably placed inside purse, cash box or in the worship room of your house. It is believed to bring good luck and prosperity to the one who possesses it. Shree Laxmi Charan Paduka: These Laxmi steps (charan padukas) are placed on both sides of the door frame. The Charan Paduka should face inside the house. Shree Dhan Laxmi Idol: This heralds wealth and plentitude. Place this beautiful idol at in the temple of your house or your work station to ensure that Goddess Laxmi’s blessing is always with you. Shree Meru Yantra: Considered highly auspicious, Shree Meru Yantra is kept in a place where you keep money and valuables. Its positive influence will help you double your assets and see a secured future. 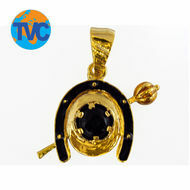 Shree Dhan Laxmi Kawach: The package contains a pair of kawach which can be worn as pendants. The kawach wards off negative influence and clears obstacles coming between you and your financial prosperity. 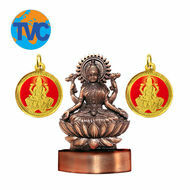 Shree Kuber Kunji: This is treated as the key to your good luck. If you are carrying this with you, there is always a chance that you would come across new opportunities to cement your growth prospects. Shree Kuber Idol : It is kept in the sacred corner of your house. This precious idol of Lord of Wealth is believed to have power to attract positive energy and bring wealth in abundance. Shree Laxmi Kuber Dhan Varsha Yantra is placed in millions of homes and workplaces and people have been able to overcome financial instability and difficulty. By establishing Shree Maa Laxmi and God of Wealth Lord Kuber, households have experienced wealth, happiness and prosperity. Install Shree Dhan Varsha and Lord Kuber Kunji in your home or your workplace today and your family will always be blessed with physical, mental and spiritual happiness. Shree Dhan Laxmi Yantra: This is preferably placed inside purse, cash box or in the worship room of your house. It is believed to bring good luck and prosperity to the one who possesses it. Shree Laxmi Charan Paduka: These Laxmi steps (charan padukas) are placed on both sides of the door frame. The Charan Paduka should face inside the house. Shree Dhan Laxmi Idol: This heralds wealth and plentitude. Place this beautiful idol at in the temple of your house or your work station to ensure that Goddess Laxmi’s blessing is always with you. Shree Meru Yantra: Considered highly auspicious, Shree Meru Yantra is kept in a place where you keep money and valuables. Its positive influence will help you double your assets and see a secured future. Shree Dhan Laxmi Kawach: The package contains a pair of kawach which can be worn as pendants. The kawach wards off negative influence and clears obstacles coming between you and your financial prosperity. Shree Kuber Kunji: This is treated as the key to your good luck. If you are carrying this with you, there is always a chance that you would come across new opportunities to cement your growth prospects. Shree Kuber Idol : It is kept in the sacred corner of your house. This precious idol of Lord of Wealth is believed to have power to attract positive energy and bring wealth in abundance.